Brake failure is easily one of the most dangerous malfunctions that can occur in your vehicle. There are many reasons why brakes fail, but even if you aren’t a mechanic, you should know the signs of brake failure so you can get your car serviced as soon as you start noticing them! Here are six ways to know if your brakes are starting to malfunction. 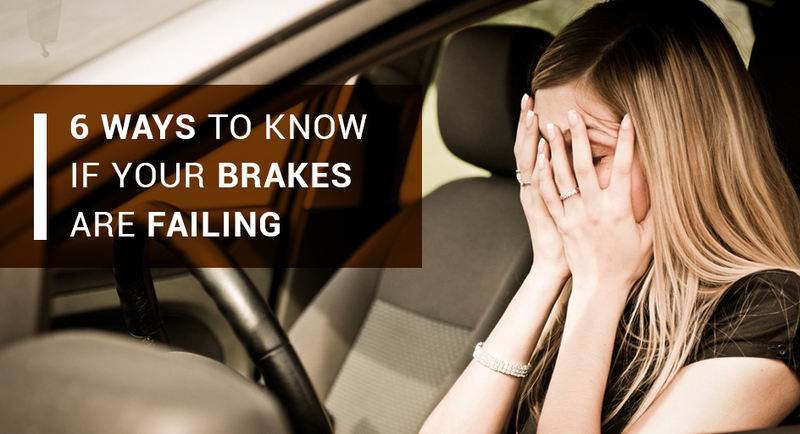 A falling brake pedal is one of the classic signs of brake failure. When your brakes are in good condition, your pedal will stay in the same position every day. If it falls toward the floor, it will be impossible not to notice. This means that your brakes are likely out of adjustment, and it could mean that there is a mechanical failure or air in your vehicle’s system. Brakes that squeal or grind aren’t just nuisances. They’re actually a pretty serious problem, because these noises can indicate that your brake pads are wearing thin and/or that the brake is worn all the way down to the rotors. When we say vibrating, we don’t just mean the slight shudder caused by your anti-lock brake system (ABS) when you slam on the brakes really hard. We mean a shudder that happens when you hit your brake normally, often accompanied by a chattering noise and a hard-to-control steering wheel. The chattering sound is usually produced by warped rotors, which the brakes can’t clamp onto as easily to stop the vehicle. If your car is pulling to one side or the other when you brake, don’t automatically mistake it for a slight misalignment! If you notice the pulling only when you apply pressure to your brakes, it could mean that one of the car’s wheel cylinders or calipers is seized or frozen. It could also mean that you have fluid leaking on the brake pads or shoes. If you begin noticing that you have to press your brakes harder than usual to slow down or stop, it could mean that one of your brakes or an axle isn’t performing the way it should. Don’t let this continue for awhile; call your mechanic and bring your car in for a checkup as soon as possible. If you think your brakes are failing, it is imperative that you get your vehicle checked out as soon as you can. Properly functioning brakes can do more than save you from a fender-bender and an insurance headache – they can save your life.